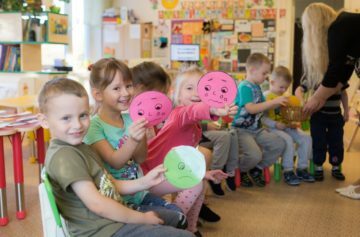 Early Learning and Child Well-being Study of OECD (IELS) was carried out in Estonia from 1 October to 21 December 2018. The study examines the development and skills of five-year-old children. IELS focuses on early childhood education, home background and learning environment, and early childhood education experiences. The assessment of the children’s skills was carried out by Study Administrators who were kindergarten teachers or employees of Innove, who had pedagogical background and experience in working with five-year-old children. More than 200 Study Administrators participated in the Main Study. 200 kindergartens and about 2200 children participated in the Main Study in Estonia. 738 early child-care institutions’ staff members filled out the staff questionnaire about themselves and the questionnaire about children was filled out for more than 2200 children. 1941 parents filled out the parent questionnaire. The Main Study involved three countries – Estonia, the United States and the United Kingdom. In Estonia, the Main Study was conducted both in Estonian and in Russian. Estonia was the only country that conducts the IELS study in a bilingual form. The study was carried out in Estonia by Foundation Innove in cooperation with the Estonian Ministry of Education and Research and Tallinn University. The IELS study report and an international study database will be published in 2020.